Should you take exogenous ketones made with beta-hydroxybutyrate? These keto powder supplements have become popular, but are they effective? I’ve been reluctant to try the popular ketone supplements as a few big ones are sold through MLM companies. 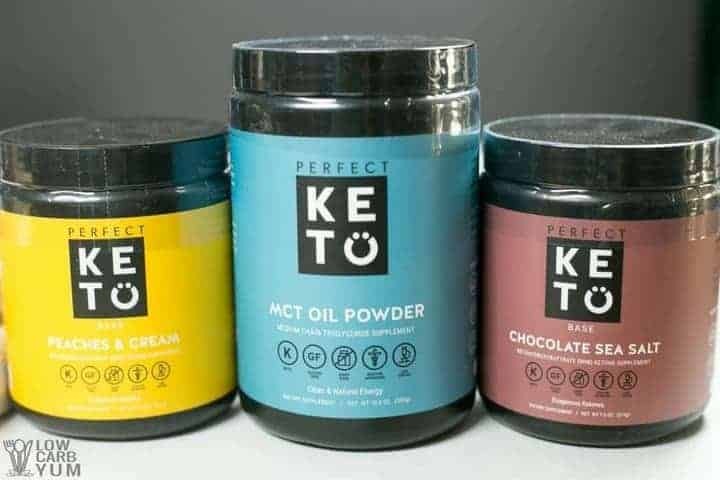 However, you can buy a similar product by Perfect Keto which offers the same beta-hydroxybutyrate (BHB) ketone bodies without the MLM sales structure. And, if you use this link to purchase, you’ll get 20% off! When your body goes into ketosis, ketone bodies are created. These are known as endogenous ketones because they are produced internally. And, there’s known benefits when you put your body into a state of ketosis. In contrast, exogenous ketones are BHB salts that are available as supplements. 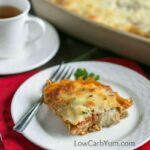 The idea is that you can get some of the benefits of ketone bodies like increased energy without following a strict keto diet. When you take a ketone supplement, it’s not the same as putting your body into ketosis by restricting carbohydrates. 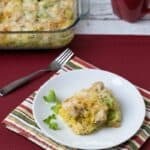 So, what’s the benefit of taking the keto powder? Using exogenous ketones may decrease appetite, boost energy, and increase athletic performance. They may also be beneficial for preventing cancer, improving brain health, reducing blood glucose and inflammation. 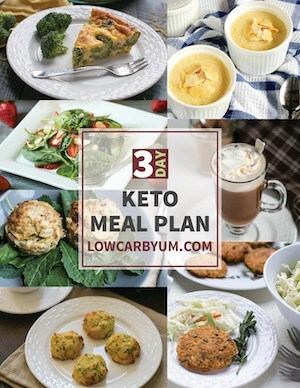 After consuming the Perfect Keto beta-hydroxybutyrate keto powder supplements, I did notice I had more energy and focus. I also experienced a slight reduction in appetite. Keep in mind that ketone supplements are not something you want to use with a high carb diet. The best way to get into ketosis is to limit carb intake. The ketone powder is an option for elevating ketones in the body to achieve specific benefits. If you think exogenous ketones can help you burn fat more effectively, you may be disappointed. I haven’t found anything that supports more effect fat-burning as a specific benefit from taking a ketone supplement. In my opinion, a ketogenic diet is the best way to see the fat-burning benefits of ketosis. 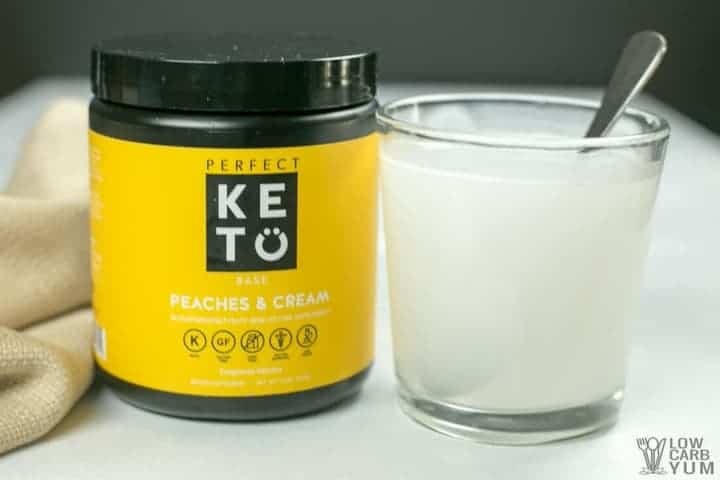 The Perfect Keto beta-hydroxybutyrate keto powder supplements come in two flavors: Peaches & Cream and Chocolate Sea Salt. I liked both flavors, but the fruity flavor of the peach was my favorite. You can mix the ketone powder into water or another neutral flavored beverage. I tried both flavors in water then in almond milk I thought both tasted better mixed into almond milk. 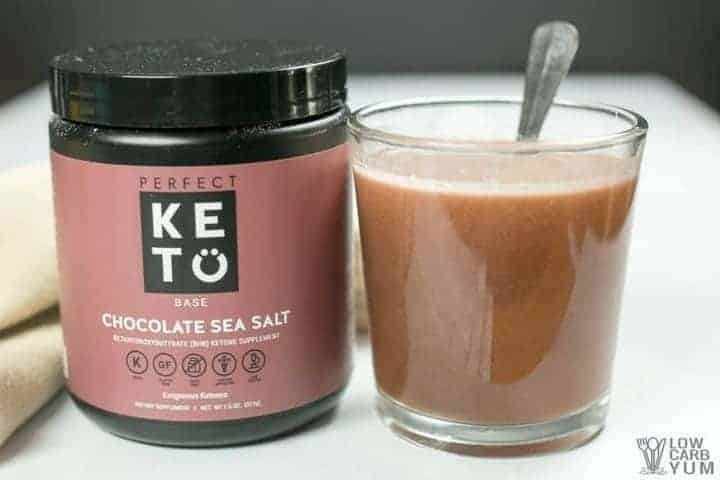 Although I didn’t try it, I bet you could also blend the exogenous ketones into your favorite keto smoothie. I’m thinking the peaches & cream might add a nice touch to either the raspberry avocado smoothie or the strawberry coconut milk smoothie as well. There’s zero carbs and only 15 calories in each scoop of powder. So, you’ll add in some flavor without adding much of anything else. 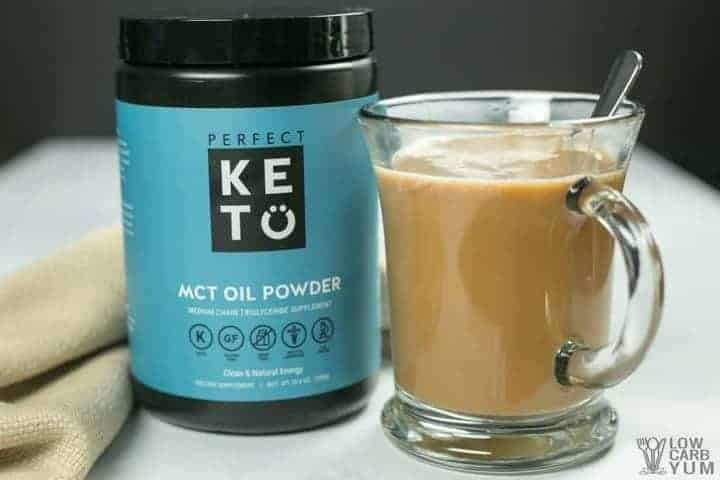 Perfect Keto also makes an MCT Oil Powder. I found it to be a nice addition to my morning coffee instead of using heavy cream. I’ll be keeping a jar in my desk at work to use as a coffee creamer. 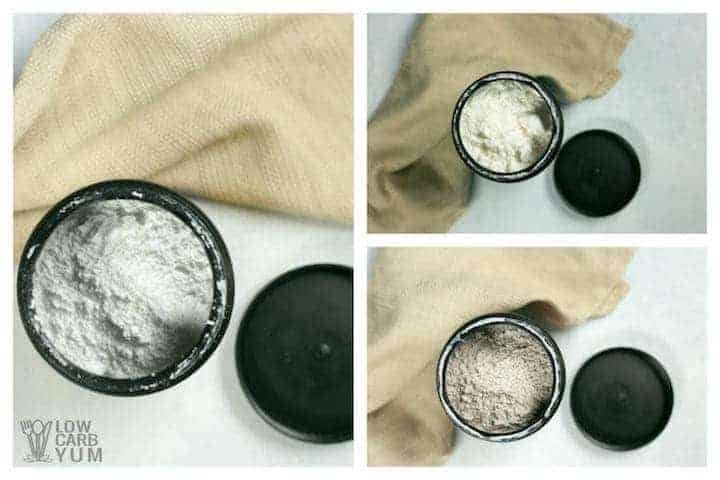 You can use the MCT powder in smoothies too or use it as an ingredient in recipes such as fat bombs. Each scoop has 7 grams of fat, zero net carbs (1 gram carb with 1 gram fiber), and 70 calories. 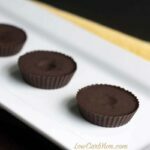 You can also use the powdered MCT oil in place of coconut milk powder in my homemade sugar free hot chocolate mix. And, you can use it for added fat in baking. Each tub of the BHB ketone supplement contains 15 scoops. You can divide those into half scoop servings if you want the tub to last a bit longer for boosting ketones. The larger MCT oil container gives you a bit more. You get 30 scoops in each tub. The great thing about using powder versus the oil is that it blends much better into liquids. 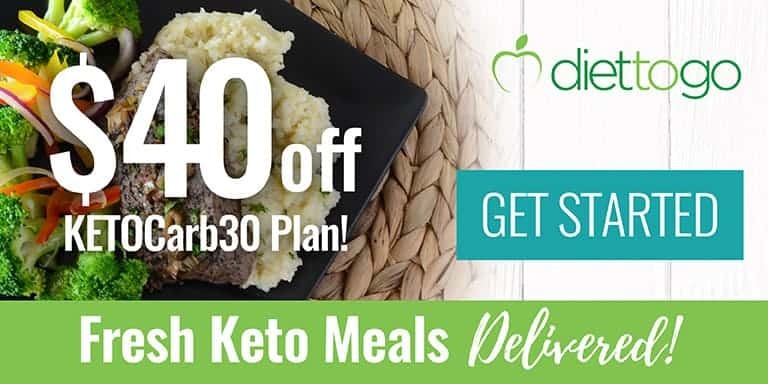 If you’d like to learn more about Perfect Keto, click here and you’ll save 20%. You can also find the Peaches & Cream, Chocolate Sea Salt, and MCT Oil powder on Amazon Prime. 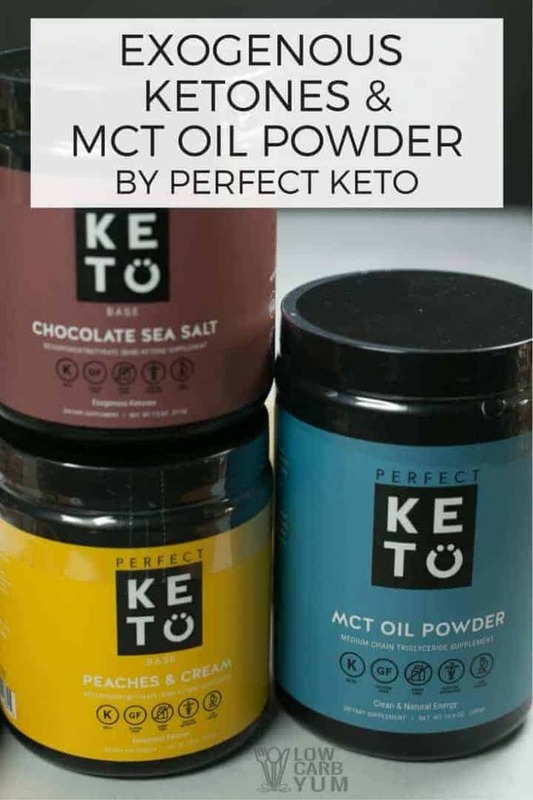 I LOVE the Perfect Keto MCT oil powder!!! 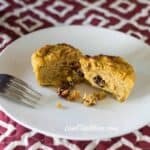 It is THE BEST…mixes nicely in my coffee or tea and I don’t even need to use a sweetener! I have a some questions regarding Ketosis and Exogenous Ketones. Then for me… If I get into steady ketosis, why would you need an extra boost and raise your ketone levels even more? Isn’t that problematic? To tell you the truth, I’m probably in and out of ketosis as I’m not a strict keto dieter. If that’s the case, then would it be recommended I take the exogenous powder daily or even twice a day? I’m a bit confused on all of this. For the fat-burning benefits, you really need to follow a low carb diet to put your body into a ketosis state. You get other benefits from exogenous ketones like better mental clarity. How does this product compare with Keto OS (MLM product)? The price is so much more reasonable, but is it comparable? They have the same active ingredient (BHB salts) so I’d say they are pretty comparable. However, I haven’t tried Keto OS so I can’t comment on taste or noticed benefits. Does this supplement taste awful? Lots of these apparently do! I thought it tasted bad mixed in water. It was fine stirred into unsweetened almond milk.